As Benjamin Franklin once noted, "Wine makes daily living easier, less hurried, with fewer tensions and more tolerance." Such wisdom provides all the more reason to hit a wine trail near you — or to include some wine touring on your next vacation outing. That's becoming easier to do than you might think. There are wineries everywhere nowadays — nearly 8,000 of them spread out across the U.S. — with winemakers at work in all 50 states. Blessed with a climate ideal for viticulture, and a long legacy of winemaking, California leads all states with nearly 3,500 wineries. Spanish missionaries brought along vines as well as Bibles when they established a chain of 21 missions from San Diego to Sonoma in late 1700s. The rest is history. Golden State wineries currently bottle almost 90 percent of the roughly 800 million gallons of wine currently produced in the U.S. each year. Everyone knows of the Napa and Sonoma Valleys — the nation's premier wine-growing regions — swarmed of course by millions of oenophiles annually. That's why we're not taking you there in this report, suggesting instead some less-traveled wine trails in places you might not expect to find them. 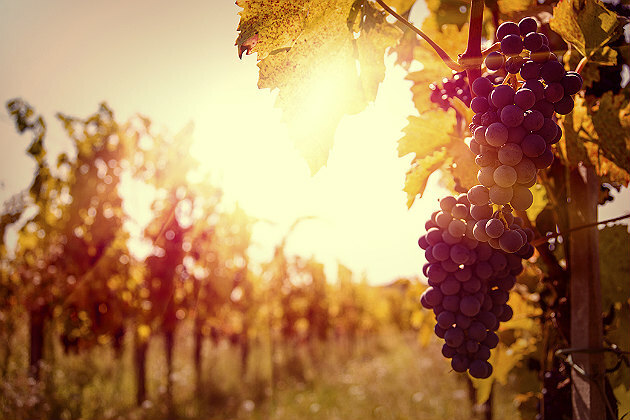 America's Wine Trails identifies 285 wine trails across the country. Here are seven offbeat examples — each, however, is noted for vintners offering some truly fine wines and visitor-friendly tasting experiences. Be advised that most of these wineries charge nominal tasting fees and some require reservations. Oregon is a major wine-producing state. Its best-known wine-growing region, the Willamette Valley, is world famous for its fine Pinot Noir wines. The Umpqua Valley to the south is far less heralded but is fast gaining recognition for its diversity of outstanding red wines, including Tempranillo, Cabernet Sauvignon, Pinot Noir, Syrah and other hybrid varietals originating from the Rhone and Alsace regions of France such as Baco Noir and Marechal Foch. The picturesque 40-mile-long valley near Roseburg is home to 21 small, mostly family-operated wineries and those rating tops for touring include Abacela Winery, Giradet Wine Cellars, HillCrest Vineyard, Reustle Prayer Rock Vineyard and Henry Estate Winery. Picturing a typical Arizona landscape, you might envision a desert scene scattered with saguaro and saltbush — not Sauvignon and Syrah, right? Defying stereotypical impressions of the Grand Canyon state's flora, northern Arizona's Verde Valley is a flourishing wine producing region — a verdant vale stretching 20 miles along the Verde River from Sedona to Cottonwood. The valley's bountiful sunshine and dramatic evening cool-downs match with a rich volcanic soil to create an ideal environment for hearty varietals such as Syrah, Petite Syrah, Viognier and Mourverde. Other popular varietals, including Zinfandel, Merlot, Cabernet Sauivignon, Pinot Noir and Pinot Grigio are grown successfully here as well. Four producing wineries — Alcantera Vineyards, Page Springs Cellars, Oak Creek Vineyards and Javelina Leap Vineyards — welcome guests to tasting rooms and, in some cases, tours. Plus, there are several tasting rooms in the communities of Jerome and Cottonwood. Long known as one of the nation's leading fruit-growing regions (as in pears, peaches, plums, apricots and cherries), Colorado's Grand Valley has turned much of its agricultural attention to growing wine grapes since the late 1970s. Nearly 20 wineries dot the region, centered in Palisade, a charming little town flanked by majestic red rock cliffs and mesas. Along with fruit orchards, there are a number of vineyards producing mostly Merlot, Cabernet Sauvignon, Cabernet Franc, Viognier, Riesling and Chardonnay wine of exceptional quality. Some of the most popular wineries/tasting rooms along the Byway are Hermosa Vineyards, Carlson Vineyards, Canyon Wind Cellars, Grande River Vineyards and Plum Creek Cellars. Surprised they make wine in the Show Me State? Don't be. During the late 1800s, more wine was produced in Missouri than in any other state. Hermann's Stone Hill Winery was at the time the nation's second-largest winery — and third largest in the world! German immigrants founded the industry, utilizing domestic grapes such as Concord and Catawba and French-American hybrids, including Norton and Vignoles, before moving on to produce fine varietals such as Cabernet Franc, Chardonnay and Mourverde. Covering 20 scenic miles between Hermann and New Haven, the Hermann Wine Trail features seven family-owned wineries, including the venerable Stone Hill Winery. Others favored by oenophiles are Hermannhof Winery, OakGlenn Vineyards, Adam Puchta Winery and Robller Vineyard. Gentle rolling hills, deep, well-drained soils and a moderate climate combine to make Bucks County's Buckingham Valley one of the premier grape-growing regions of the eastern United States. A wide range of grapes are grown here, including traditional European varietals like Chardonnay, Cabernet and Pinot Gris; American standbys, Concord, Niagara and Catawba — plus some French-American hybrids like Seyval, Chambourcin and Vidal. Vineyards prime for a visit include Crossing Vineyards, New Hope Winery, Peace Valley Winery, Rushland Ridge Vineyards, Sand Castle Winery, Wycombe Vineyards and Unami Ridge Winery. Boasting more than 40 wineries and tasting rooms, the Loudoun Valley is emerging as the top wine region in Virginia — a state designated one of the nation's "10 Best Wine Travel Destinations" by Wine Enthusiast Magazine. Known as D.C.'s Wine Country due to its proximity to Washington D.C., Loudoun vineyards share a rural landscape with horse farms and historic estates just 25 miles from the nation's capital. Most of Loudoun’s wineries are small, family operations of the boutique variety where guests indulge in tastings, tours, food pairings and friendly conversation with winemakers. The wines produced here are largely Cabernet Sauvignon, Cabernet Franc, Petit Verdot, Merlot, Malbec and Viognier. Top wineries along the trail include Breaux Vineyards, Lost Creek Vineyard, Hidden Brook Winery, Chrysalis Vineyards, Stone Tower Winery and Fabbioli Cellars. New York is justifiably famous for its Finger Lakes region wines, but most outsiders would be surprised to learn that some of the Empire State's finest wines are produced on Long Island, just a stone's throw from the teeming metropolis of Manhattan. The island's viticultural areas are noted for sandy, loamy soil and temperatures moderated by the Atlantic Ocean, Long Island and Great Peconic Sounds — conditions favorable for grape growing. That includes quite a variety of grapes, as evidence by the many kinds of wine produced at Long Island's more than 40 wineries. Among them are Merlot, Cabernet Sauvignon, Cabernet Franc, Pinot Noir, Chardonnay, Sauvignon Blanc, Gewürztraminer, Riesling, and a variety of sparkling wines, rosés and Bordeaux-style blends. Newsday, Long Island's daily newspaper, recently listed its favorite wineries, and among them are Bedell Cellars, Channing Daughters Winery, Jamesport Vineyards, Lenz Winery, Shinn Estate Vineyards and Wolffer Estate Vineyards.